I'm already in deep love with my new black TOBAN (Iga-yaki donabe skillet). Here's my brand new black toban with handles. I hope you can see the rustic "wabi-sabi" beauty, which is an inherent characteristic of authentic Iga-yaki donabe. It's so beautiful that I can't keep my eyes off it. My first dish with this toban was simple Tofu Steak! 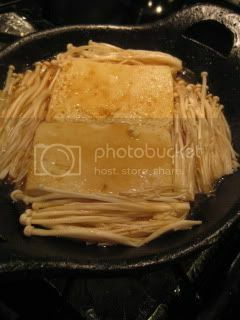 I simply seared sliced tofu with enoki mushrooms and drizzled soy sauce to finish. Tofu was so hot and fluffy inside. 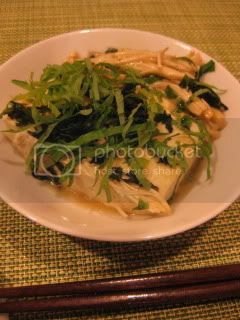 It made a great izakaya-style dish. 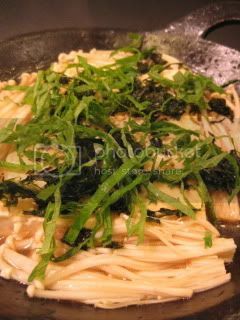 You can find the recipe on toiro's website.